In the coming months, you’ll be seeing some big changes at the Deschutes River Alliance. We are reorganizing with an eye towards managing for the continued success and growth of our science, legal, and advocacy programs. Ultimately, these changes will allow us to more effectively achieve our mission of protecting the Deschutes River. These changes come on the heels of an announcement from our Executive Director, Jonah Sandford, that he will be leaving the DRA to join the Northwest Environmental Defense Center, one of the leading legal advocates for environmental issues in the Pacific Northwest. Although we hate to see him go, we are probably as excited about this new opportunity for Jonah as the Northwest Environmental Defense Center is. Jonah has done a tremendous job for the DRA and we know he will be successful in his new position at NEDC. Jonah and Jasper Sandford. We’ll particularly miss seeing Jasper’s face in the DRA’s newsletters! As we move forward in the next chapter of the DRA, our new Executive Director will focus on increasing our capacity in areas such as public relations, communications, and organizational management, all while leading DRA’s advocacy efforts on behalf of this remarkable river. A search for a new Executive Director has already begun. We anticipate having the position filled by mid-May to early June. Krista Isaksen has been an outstanding Development Director for the DRA, as exemplified by the success of our annual auctions these past two years. She will be continuing in that role, as well as taking on more operational responsibilities. Her new title will be Director of Operations and Development. In addition, we have hired Wesley Noone as a full-time Science Team member. He will be coordinating our field work and helping us publish our scientific work. Despite the many papers and reports we’ve published, we have a backlog of data to report and Wesley will play a major role in getting those data published. We will continue with the legal support of Dan Galpern and Doug Quirke, who have been our external legal counsel and representation for the past three years. They will continue to represent us in our lawsuit against the owners/operators of the Pelton-Round Butte Hydroelectric Complex. We are saddened to see Jonah leave the organization, but we are thrilled for his new opportunity, and we’re looking forward to implementing the next chapter of the DRA. It is an outstanding opportunity to re-structure the organization so as to maximize our effectiveness in the coming years. We will be sure to keep you updated as we progress through these exciting transitions. Attention Bug Watchers: Announcing DRA’s New Lower Deschutes River Hatch Survey App! 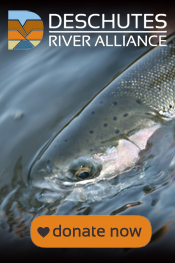 We are proud to announce the release of DRA’s new Lower Deschutes River Hatch Survey App! This app is easy to use on any smartphone, and allows users to easily gather and upload information on aquatic insect hatches in the Deschutes River. We hope you’ll add it to your phone today, and use it to help us more fully understand aquatic insect populations and hatch timing on the lower Deschutes. Since 2013, DRA has collected macroinvertebrate hatch data from river guides who documented the presence and abundance of major adult aquatic insect hatches during their guide trips on the lower Deschutes. These survey results have been collected and analyzed in annual reports, which can be found on our website. This hatch data provides essential information about changes to the river’s insect community, as well as important insights about the overall health of the lower Deschutes River ecosystem. This year, DRA has partnered with Trout Unlimited to create an app to make the survey process more streamlined and user-friendly, and we want your help collecting data! The app can be added to your phone’s home screen, data can be collected even when you’re out of phone service, and we’ve added photographs and other features to ensure the app is easy to use and data collected is accurate. We will host a training session and kick-off for the app on Sunday, March 24 in Maupin, and all are invited (see details below). In the meantime, we invite everyone to access the app and familiarize yourself with its features. A guide to the survey, including how to access it and a brief tutorial, can be found here. The training session will answer all your questions about how to use the app, how to identify the major hatches, and a summary of past results. Please RSVP for the event by emailing Krista at krista@deschutesriveralliance.org. We’ll see you there! Pale Evening Dun. Photo by Rick Hafele. We are pleased to announce the release of a new DRA report: Mapping Water Quality and Land Use in the Crooked River Basin, Oregon from 2010-2014. Using Geographic Information System (GIS) technology, the report provides, for the first time, maps and analysis of currently available water quality data collected throughout the Crooked River basin. We believe this report will be the first in a series of meaningful steps to address nitrogen pollution in the Crooked and lower Deschutes rivers. DRA’s primary focus remains securing evidence-based management changes at the Pelton Round Butte Hydroelectric Project, to protect and restore water quality in the lower Deschutes. We believe there are available operational changes that would immediately benefit the lower river, and we will continue advocating for these measures. But it is also essential, for the long-term health of the entire basin, that Crooked River water quality be addressed as well. Our new report provides an initial roadmap for that work. In 2015 and 2016, DRA undertook a water quality sampling project in Lake Billy Chinook. This effort included sampling at the mouths of the three major tributaries to the Deschutes River—the Crooked, Middle Deschutes, and Metolius rivers. This sampling made clear that the Crooked River, in particular the consistent load of nitrogen-based nutrients it delivers to Lake Billy Chinook, is the primary cause of annual algae blooms in the reservoir. Further, because that Crooked River water is now discharged directly downstream, via surface water withdrawal at the Pelton Round Butte Hydroelectric Project, pollutants from the Crooked River are the primary driver of new nuisance algae blooms, as well as impacts to water quality and aquatic invertebrates, in the lower Deschutes River below the Project. As a result, we believe it is essential for the restoration of both the Crooked and lower Deschutes rivers that sources of water quality pollution in the Crooked Basin be more fully identified and understood. To do this, DRA commissioned a GIS mapping project to examine data collected between 2010 and 2014 by the Crooked River Watershed Council and the Oregon Department of Environmental Quality. The resulting maps and analysis provide a critical first step for DRA and other stakeholders interested in tackling nitrogen pollution in the basin. The report is already guiding DRA’s 2019 monitoring efforts in the Crooked River. We believe that efforts to reduce nitrogenous pollution in the Crooked River are essential to the long-term future of the Deschutes Basin and the fish, wildlife, and people who live there. We are proud to be involved in these efforts, and this year we are expanding our scientific research into the Crooked River. Through these additional monitoring efforts, we will gain a better understanding of the river’s water quality issues, and begin identifying strategies for reducing the nitrogen load transported into Lake Billy Chinook. While these efforts are underway, however, it is important to remember that these Crooked River pollutants do not have to be transported from Lake Billy Chinook into the lower Deschutes River. For the first 50+ years of Round Butte Dam’s existence, all water discharged to the lower river came from the bottom of Lake Billy Chinook. That water, generally of Metolius River origin, is much cleaner than the Crooked River water at the surface of the reservoir. Discharge of Metolius River water helped create the high quality conditions that made the lower Deschutes a world-class habitat for insects, fish, and wildlife. And that cool, clean water is still down at the bottom of Lake Billy Chinook. As DRA expands our research and outreach in the Crooked Basin, we will continue to advocate forcefully for evidence-based management solutions at Pelton Round Butte and in the lower Deschutes River. DRA’s new report provides the first GIS basin-wide analysis of water quality in the Crooked Basin. It will help guide our research in 2019 and beyond, and we are proud to release it today. Special thanks to Elinore Webb, the report’s lead author and GIS specialist, for all her work bringing this report to completion. And thanks to the Crooked River Watershed Council for allowing us access to their water quality data. A huge THANK YOU to all who came out to join us for the DRA’s Annual Gathering and Auction on Saturday, February 9! Despite ominous reports, the weather (more or less) cooperated, and we were thrilled to host a full room again this year. New and familiar faces alike joined us at beautiful Montgomery Park. It was truly an honor to see so many supporters in one room, all with an incredible passion for the Deschutes River. Again, we cannot thank you enough for coming out and showing your support. 2019 is proving to be a critical year for the DRA, and your contributions are crucial to the success of our ongoing science and legal endeavors. The funds we raised at the auction will go directly to support our efforts to restore cooler, cleaner water to the lower Deschutes. We are proud to announce the release of DRA’s newest documentary video, A River of Memories. The film includes interviews and other footage of Mike McLucas, the legendary fishing guide and owner of Maupin’s Oasis Resort. Mike reflects on the history of the Deschutes River and on his life fishing, learning, and experiencing the wonders of this remarkable place. In the process, he presents a vision for what this river is capable of, and what DRA is working to protect and restore. The video debuted last Saturday, February 9, to a packed house at DRA’s annual Gathering and Auction. It was an incredible afternoon, with guests traveling from across the state (some through extreme weather) to show their support for DRA and this incredible river. Watch for a full recap of the event in the days to come. Check out more DRA videos here.